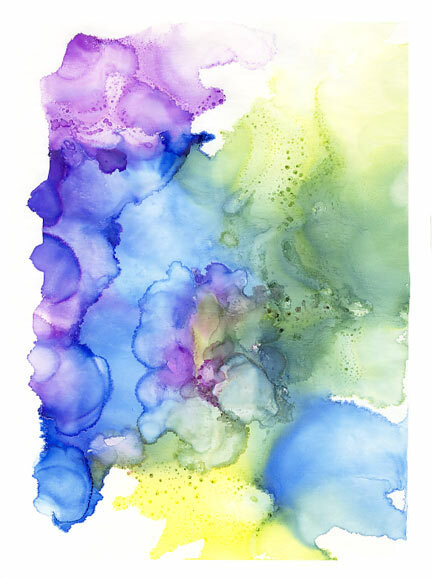 Alcohol inks can be used in a similar way to watercolors, where they are dripped and manipulated on a wet substrate. In this case, it would be wet with either 91% rubbing alcohol or a blending solution. But there is a variation on this method that I want to show you, because you can get just a bit more control over what happens with just a slight change in technique! Put your rubbing alcohol into a squeeze bottle and use it to make a design line on your page. 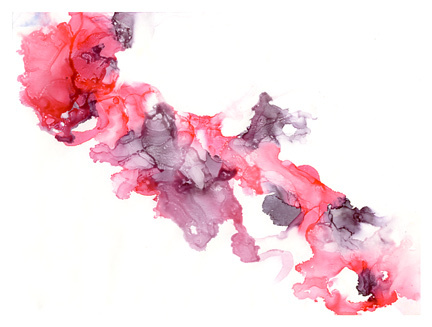 Right next to this line, but not quite touching, add lines and/or drops of alcohol inks. 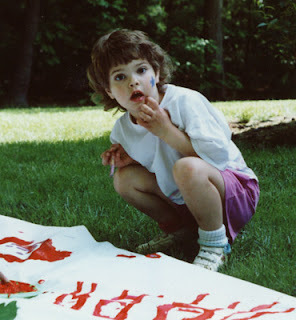 Then use a straw, a hair dryer, or a heat gun to sharply blow the inks up into the rubbing alcohol line. Manipulate them as desired and let them dry slightly. Add more lines and more ink as desired, working either in from the other edge of the paper, or continuing along the edge of the inks already added. 1. 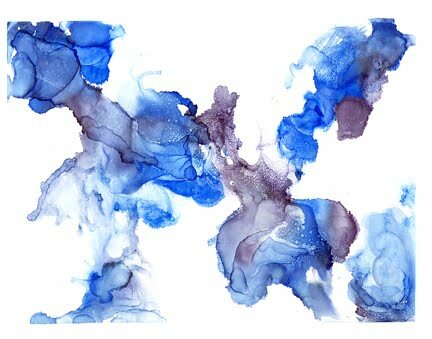 Put a drop or two of ink into a small puddle of 91% alcohol. Use a squeeze bottle for your plain alcohol to control the amount. 2. Use a hair drier or a heat gun to blow around the outside of the puddle, pointing it towards the center. Move the air quickly so that the ink doesn't dry in one spot. Try for multiple rings, and try not to let the moving alcohol lap over the edges of your puddle. 3. If you don't get as many rings as you'd like, add a small drop of additional ink to the center and repeat step 2. Joanne Sharpe has done it again! 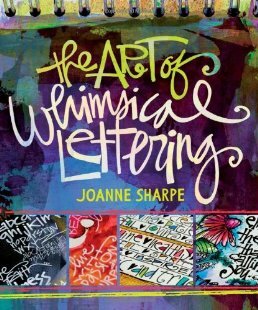 In her first book (shown below), Joanne taught the basics of creating hand lettered alphabets that didn't take years of calligraphy practice to master. 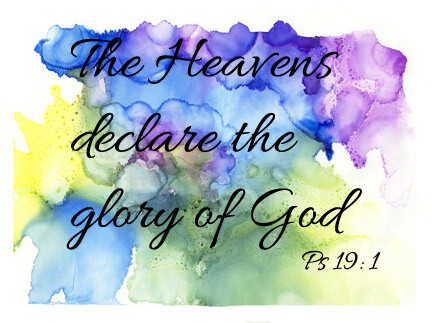 In her newest (shown above), she shares 55 new ideas and fonts that you can try, tweak, and make your own! 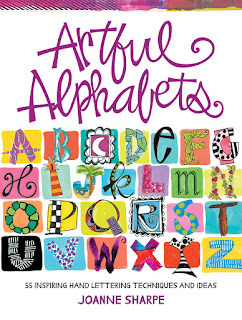 If you don't own the first book, don't let that stop you from getting Artful Alphabets. The basics are covered again. Joanne's style is light and whimsical, but you can easily morph the imagery being used to suit your own style. Personally, I have always disliked my own handwriting, and I really appreciate Joanne's admonition to embrace it and see what comes out! The biggest adjustment I've had to make is to remember that I am *drawing* my letters, not simply writing them! Last week, I showed you the first of several techniques that I've been using to experiment with alcohol inks. Here are some of the other pieces that I made using this wet into dry method. 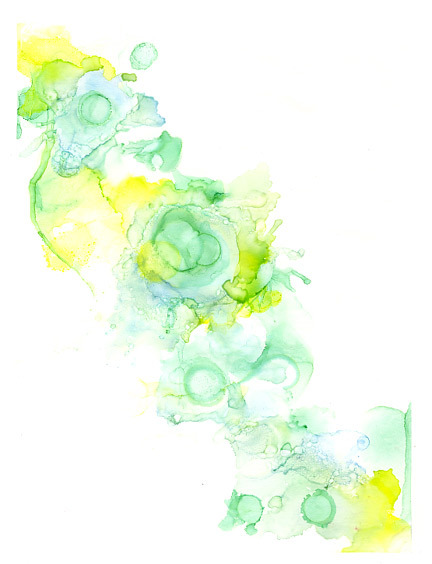 To recap, you drip your alcohol ink colors onto a dry background. They can sit there and dry, or you can begin working with them while they're still wet. Using 91% rubbing alcohol in a squeeze bottle, you add the solvent to one small area at a time, manipulating the running inks with a blower. You can use a hair dryer (set on cool), canned air, a heat gun (at a distance), or even just a straw. One of the things I most like about this method is the airy, wispy, ethereal look that you can get. Since I am pathologically organized, I just had to set aside time to systematically try out all of the different methods of painting the alcohol ink that I'd seen. 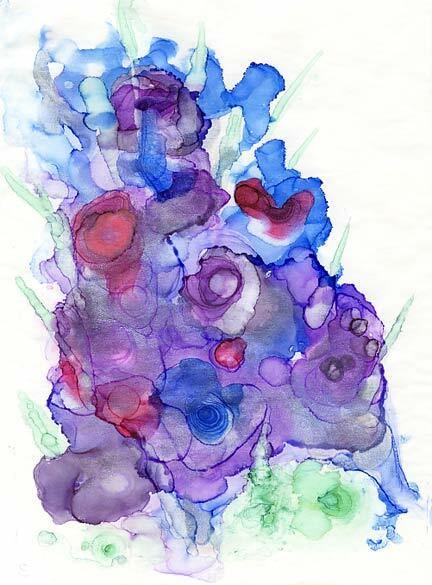 My favorite video tutorials are all linked up in my Alcohol ink Pinterest board, so take a look if you want even more. Also, don't forget Cathy Taylor's excellent book, which I've reviewed here. I'll be showing you my results over the next few weeks. For the first go, I decided to try the technique where you drip your alcohol ink colors onto a dry background. Using 91% rubbing alcohol in a squeeze bottle, I added the solvent to one small area at a time, manipulating the running inks with a blower. You can use a hair dryer (set on cool), canned air, a heat gun (at a distance), or even just a straw. Even now that I've worked through about a dozen different techniques, this continues to be one of my favorites. You can control about 30% of the outcome, slightly more as you get more adept at handling the air. I was super in love with Fire on High, and then I had to go and experiment further on it. And I ruined it! But not to worry...I scanned it at high resolution first. 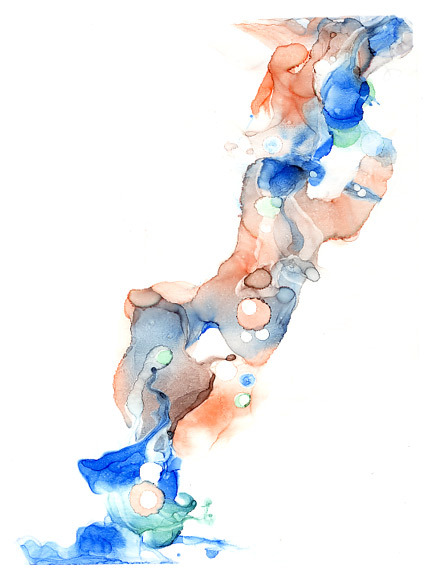 Since alcohol inks don't appear to be trustworthily archival, my digital piece is more important to me in the long run than the physical piece I ruined!